You can't ride ‘em all... at least I can't. 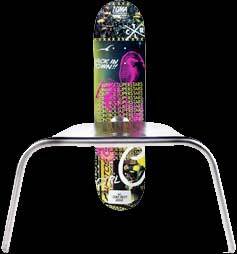 Every time I see a cool skate deck, I feel compelled to buy it. Not because I'm dying to set up another skate, but I feel I'd somehow be missing out if I didn't buy it. Consequently, I have a lot of decks laying around that are bordering on being clutter. So, what can you do with them? Start small with something like a coat rack. Cut the nose or tails off of a few decks and bolt them to a board and add a few hooks. Voila! A place for you coats and hats with a bit of skater flair. 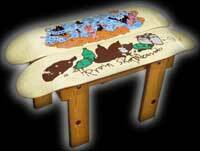 Try using blanks and stain each one differently or create some artistic montage across all the pieces. Don't stop there, start thinking bigger. Try a small table. Two decks attached as the table-top will make a slick end-table or night stand - customize the height to your needs. Building a square frame is pretty easy - just make sure to use wood-glue along with screws or bolts. Measure the distance between the pre-drilled holes so you can align the frame with those handy pre-drilled holes for attaching the decks as the table-top. 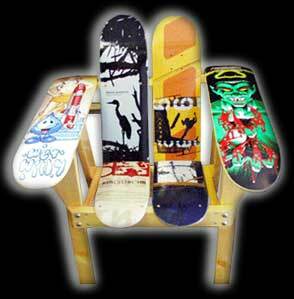 A chair might be a little harder depending on how you decide to incorporate the skate decks. I tend to look at different designs and see which horizontal planes could be replaced by a sk8 deck, like the seat, back rest or arms. Simply replacing these elements with sk8 decks tends to be easiest for me. Looking at this chair illustrates all the planes on which a deck could be attached. You may even want to shop for two specific decks to create a symetrical look. 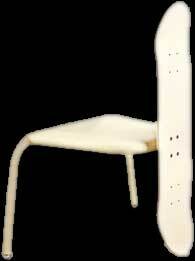 For example each arm rest could be made from two decks with the same graphic. This idea could be applied to any area to create this sort of symetry. Perhaps you'd like to make the seat from wider old school decks and use the narrower popsicle stick decks for the arm rests. You may want to take a more mininalist approach like these chairs by Tunto Design. Whatever type of project you wish to undertake, make sure you have the necessary skills (woodworking, welding, etc.) before getting too deep in the mix.